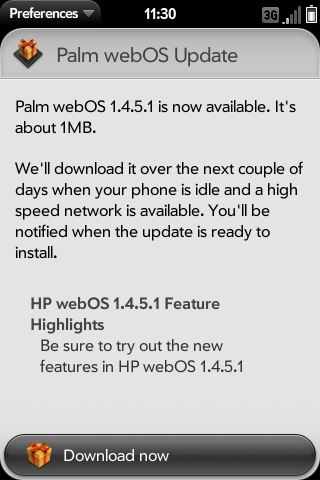 We first heard of webOS 1.4.5.1 all the way back in July 2010, the “bug fixes and not much else” follow-up to webOS 1.4.5. In fact, that was before 1.4.5 had even landed on Sprint, as 1.4.5.1 was supposed to fix the PDK Fstab bug. Well, 1.4.5.1 never came, and eventually 1.4.5 was released to all (except Telcel in Mexico) by August 2010. Fast forward to today, and now we’re hearing that 1.4.5.1 is slowly trickling out. Only a few users have reported actually having the update available, and we haven’t been able to pull it on any of our Pre phones still running 1.4.5. But that doesn’t mean it doesn’t exist, and the webOS Developer Relations Twitter account confirmed that this is in fact a real update - even if it's not available to you just yet - but it seems that all it contains are some bug fixes, eight months after the fact (a pace that makes even Microsoft seem fast on its feet). Sorry folks, no new features, no new App Catalog, but maybe your PDK games will be able to save their data now. Source: Palm webOSdev (Twitter); Thanks to Wes for the heads up!